After a few leaky days in the run-up to its big debut, Electronic Arts took to the Star Wars Celebration festival this weekend to officially announce Star Wars Battlefront II. With this upcoming sequel, EA seems to be taking aim at the many criticisms levied against its divisive Battlefront reboot. The biggest addition is a single-player campaign telling a new, in-canon Star story that takes place between Return Of The Jedi and The Force Awakens. 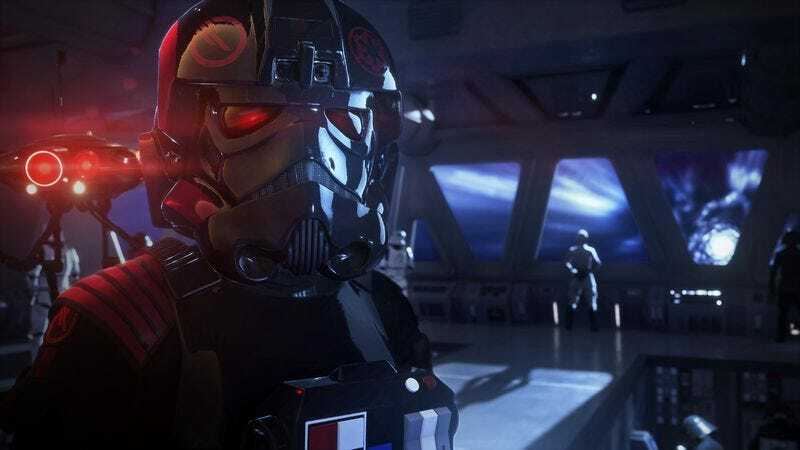 As seen in the debut trailer above, the campaign follows a character named Iden Versio, an elite Stormtrooper who leads a special forces unit known as Inferno Squad. While fighting in the Battle Of Endor from the end of Episode VI, Versio witnesses the destruction of the second Death Star and swears revenge against the Rebellion. According to EA, Battlefront II’s story will follow her and Inferno Squad on a 30-year journey of “revenge, betrayal, and redemption” in which players will visit planets both new and old and meet famous characters from the films that they’ll also take control of, like Luke Skywalker and Rey. Aside from the story mode, Battlefront II is looking to expand its signature multiplayer skirmishes. There will be space battles this time around and the game features plenty more settings, weapons, and playable characters from throughout all three Star Wars trilogies, including new hero units like Darth Maul, Yoda, and Kylo Ren. The game is scheduled to release on November 17, 2017 for PC, PlayStation 4, and Xbox One.